Over 2 dozen comments later, we have 5 winners. Before I announce the winners of this comment contest, thank you to everyone who participated. Although leaving a comment is easy, this contest required a burst of creativity. More than a few people took up the challenge, and one – Yonatan Silver – took it up more than once. Thank you all. 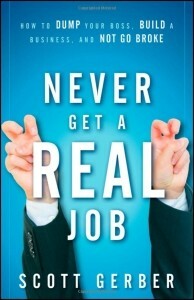 Thank you also to Scott Gerber for sponsoring the contest on the occasion of the launch of his new book Never Get a “Real” Job, which is getting some great reviews, so the winners really have something to look forward to. Thanks again to all the winners, I'll be in touch with you each in the next day or 2. Thanks again to all the other participants as well. If you didn't get into this contest, don't worry, there will be others soon enough. Subscribe to JobMob via RSS or email and follow me on Twitter for more fun job search-oriented contests. Winners of the Never Get A “Real” Job Comment Contest: Over 2 dozen comments later, we have 5 winners. I’m sorry I missed that contest too.